Led by ANTHC’s Food Distribution Program, the Food Distribution Program on Indian Reservations (FDPIR) provides a month’s supply of nutritional food to eligible households. FDPIR is a federal program funded by a United States Department of Agriculture Food Nutrition Service grant. FDPIR food packages may include fresh produce, canned meats, poultry and fish, canned fruits, vegetables and beans, canned soups and sauces, pasta, rice and other grains, cheese, egg mix, dry and evaporated milk, flour, cornmeal, bakery mixes and more. Eligible households include Alaska Native households in Alaska Native Tribal communities, American Indian and non-Indian households residing on a reservation and households living in an approved area that include at least one member of a federally recognized Tribe. To be considered, households must also meet income standards. All federally recognized Tribes in Alaska are all eligible to administer FDPIR, provided they can follow USDA regulations to guarantee food safety, protect client privacy and meet on-time reporting requirements. Tribes interested in administering FDPIR can contact the ANTHC FDPIR Program and complete the ANTHC Tribal Information & Application Packet. FDPIR food eligibility for households is determined by financial and non-financial standards set by the Federal government. Households must be recertified every 12 months and cannot participate in both SNAP and FDPIR at the same time. 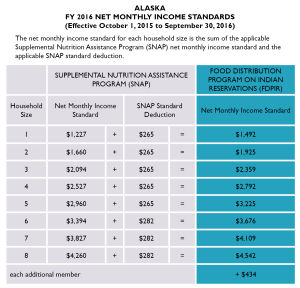 The net monthly income standard for each household size is the sum of the applicable Supplemental Nutrition Assistance Program (SNAP) net monthly income standard and the applicable SNAP standard deduction.